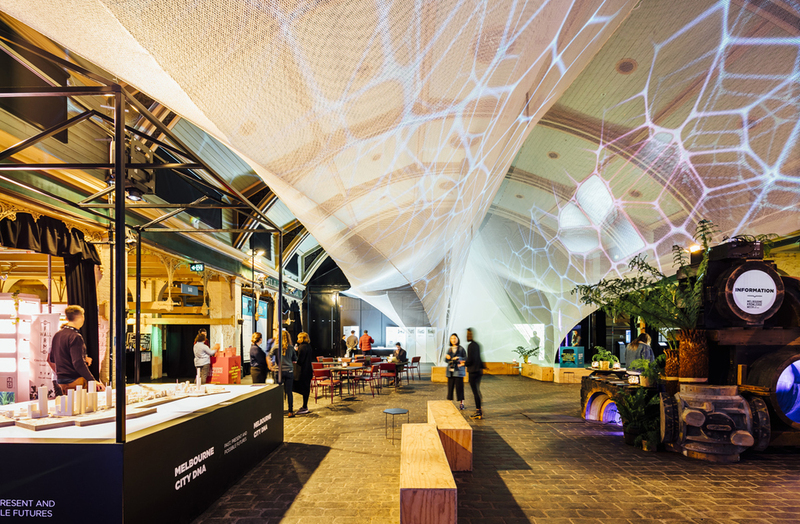 The Meat Market in North Melbourne has been transformed into a giant installation for Melbourne Knowledge Week (MKW18), the City of Melbourne’s annual festival that explores the future of Australia’s fastest growing city. 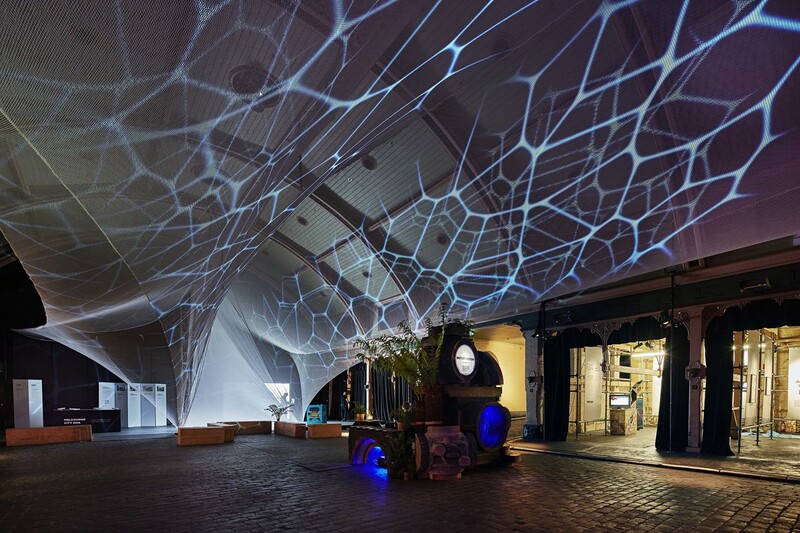 Designed by Grimshaw, the installation comprises approximately one square kilometre of fruit netting. 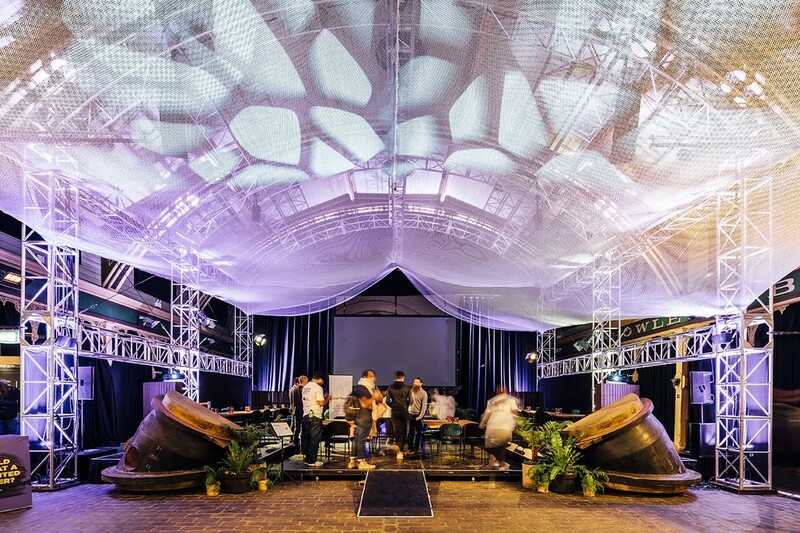 The tensile structure has been manipulated to provide an atmospheric experience of movement and light that envelops and connects the programmed events and discussions of MKW18, explains Grimshaw managing partner and MKW18 City design ambassador, Neil Stonell. “Our design takes its cues from the term ‘watershed’, which we’ve interpreted as a collector of ideas, turning points, and breakthrough moments about our city’s future. It’s also an acknowledgement of water as our most sacred and increasingly scarce resource,” he says. Designed in collaboration with Arup, Supa Dupa Industries, and Swinburne University, Watershed’s form responds to the tight constraints of the site; a one-day bump in, no fixings to any part of the interior of the heritage protected Meat Market building, and a minimal budget for materials. The design team incorporated recycled and repurposed building materials and the 24-hour install limit required high-level creative thinking and collaboration from the design and construct team. 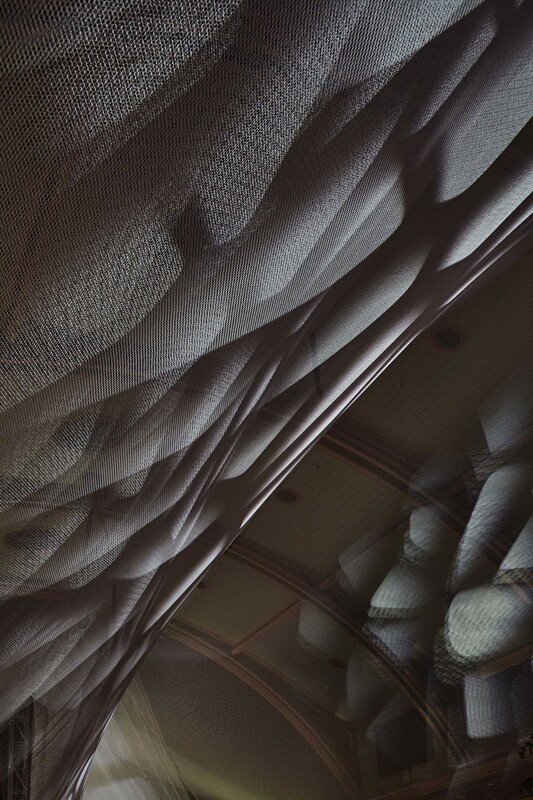 Stretching to lengths of 25 metres at points within the hub, the netting is connected by rope to existing theatre rigging elements within the interior of the Meat Market. The netting is the only new material to form part of the Watershed installation, and will in turn be repurposed to service local food growers. As part of the design process Grimshaw met with Wurundjeri Elders to gain awareness of the traditional land owners’ principles of sustainability, learning that watersheds, in themselves, are landscape forms that have shaped the social bonds of Indigenous Australians – a serendipitous alignment with the installation’s theme of coming together to share knowledge. In addition to the netting, vintage artefacts of hydraulic engineering – enormous wood casting moulds salvaged by Supa Dupa Industries – speak of the scale and purpose of servicing our cities, prompting visitors to think about what this infrastructure may look like in the future.